AMSTERDAM, 13 SEPTEMBER, 2013 – When the Brussels-based television production services facility Videohouse needed to install new loudness meters in the fleet of OB vans it employs for live sports coverage, it turned to RTW (IBC Stand 8.D92), a leading German vendor of visual audio meters and monitoring devices for professional broadcast, production, post production and quality control. 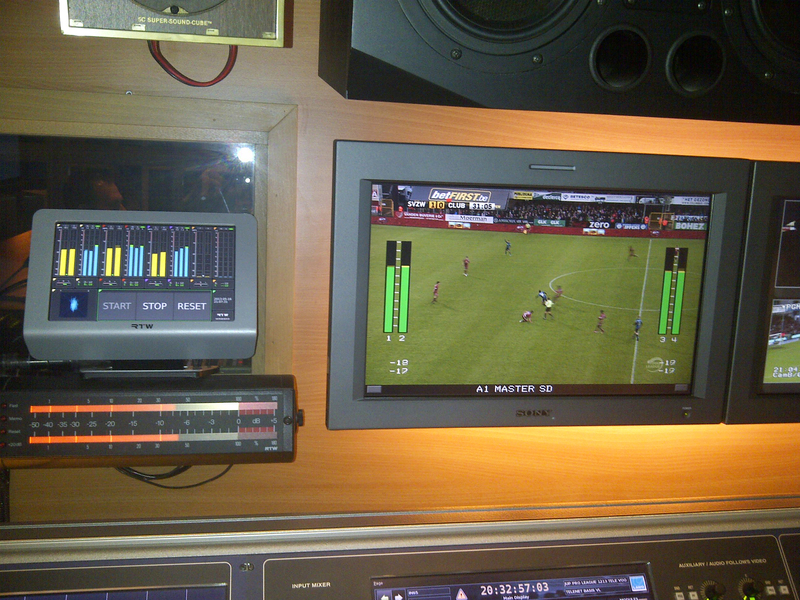 Videohouse chose RTW’s TM9 and TM3 TouchMonitors to help it comply with current EBU-R128 loudness standards. Its video team has installed the TM9 meters in the company’s larger HD/SD-capable OB vans, and the more compact TM3s in its smaller OB vans and SNG trucks. A division of the Euro Media Group, Videohouse is regularly contracted to broadcast live weekend coverage of the Belgium National Football Team (Rode Duivels/Red Devils), the annual Cyclo-Cross worldwide cycling event and other major sporting endeavors. In addition to ensuring the audio is smooth for these projects, the audio team at Videohouse must make two different mixes of each broadcast to cover two of Belgium’s three official languages (Dutch and French). Because of this, it must pay extra close attention to loudness variables. For that task, Videohouse Chief Sound Engineer Koen Bredael and his team use the four AES inputs included on the TM9 and three AES inputs included on the TM3 meters to measure the different mixes. Both the TM9 and TM3 offer PPM and true-peak instruments and comprehensive loudness metering in compliance with all globally relevant standards, including EBU R128, ITU BS.1770-2/1771, ATSC A/85 and ARIB. Instruments include single-channel and summing bar graphs, loudness range and numerical displays. The TM9 TouchMonitor features a 9-inch touch-sensitive display, with software that visualizes multiple sources simultaneously and supports the ability to display the same signal on multiple instruments in parallel, each with dedicated defaults with both horizontal and vertical operation. The TM9 visualizes up to 16 analog and/or digital sources at the same time. Plus, when equipped with the 3G SDI option, which Videohouse chose to include, the TM9 is capable of providing a view of up to 32 digital channels. With its 4.3-inch touchscreen, which can also be viewed horizontally or vertically, the more compact TM3 TouchMonitor is well suited for smaller production and post-production environments such as Videohouse’s SNG trucks. The intuitive concept allows for fast selection of presets that are configured using the Device DC1 software, which is available for Mac and Windows. The TM3 stereo version handles analog and digital audio, while the TM3-6CH version also supports six-channel digital input (an upgrade option for stereo units is also available). RTW’s range of products currently include the SurroundControl series for monitoring, controlling and routing stereo, multichannel and surround audio and the TouchMonitor range, which truly marks a paradigm shift in visual audio monitoring and loudness metering. Combining maximum flexibility and modularity with an intuitive touch-enabled surface and multichannel signal analysis, the Touchmonitor units are the essence of many years of experience. The attractively priced TouchMonitor TM3 entry-level system opens new markets, targeting applications such as journalist cubicles, edit suites and small control rooms.